Most metal or hard plastic electrical switch/grid plates, spurs and sockets can be engraved and colour filled to customers own unique wording, clearly stating each switch or sockets purpose. This permanent process means all switches are clearly highlighted and makes life a lot easier for those working or living in unfamiliar surroundings and helps avoid important equipment like computers being turned off by mistake causing untold problems. These are suitable for areas such as offices, hotel rooms and rental properties. If you’re looking for something that won’t wear as fast, you may benefit from using traffolyte labels instead. Unlike traffolyte, these engraved switch plates have the engraved areas filled with paint, meaning that very heavy usage could make the paint wear off. Imagine the simplicity of entering a hotel room or office and not having to ask which is the patio fan switch. Engraved switch plates are a convenience in many settings. Even in your home, where you can have multiples switches on one plate, engraving makes them easier to use. Accurately labelling will prevent children and new users from switching the wrong appliances on/off. At Able Engraving and Design, we understand the importance of a well-labelled switch. You can hire our engraving services to ensure that electrical plates get durable, legible and customised labelling. Whether it’s a large-scale project for a business or just a few plates for your home, our engravers will do a satisfactory job. Our experts have worked with different materials over the years, which gives them invaluable experience. You can get our switch plate engraving services for various types of installations. Stainless steel, brass and plastic are some of the materials that we can etch. You can opt for simple text or something more intricate like an image on the plate. Look at various of the personalisation options we offer to see if one suits your needs. Alternatively, tell us what type of engraving you prefer, and our professionals will make it happen. Depending on the frequency of use, the labelling on a switch plate can wear out very fast. Engraving is one method that guarantees that the writing remains legible even after several years. With engraved switch plates, you don’t have to worry about the text washing or peeling off after months. It is why engraving is recommended for commercial and industrial settings. You can choose to have colours added to the switch plate as part of the personalisation. 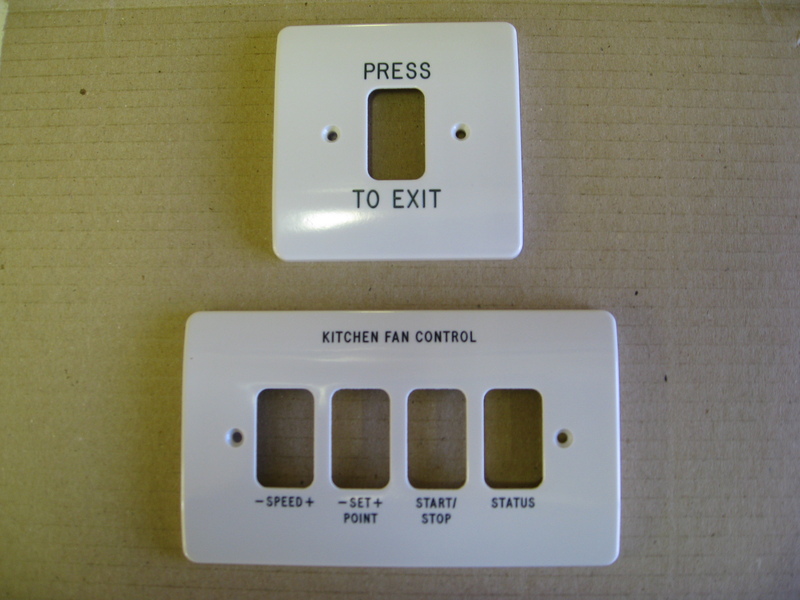 Are you looking to engrave switch plates for emergency buttons, kitchen appliances or an alarm? Then, contact Able Engraving and Design for reliable and affordable services.